Astronomers have discovered thousands of exoplanets in our galaxy, the Milky Way, using the Kepler satellite and many of them have multiple planets orbiting the host star. By analysing these planetary systems, researchers from the Australian National University and the Niels Bohr Institute in Copenhagen have calculated the probability for the number of stars in the Milky Way that might have planets in the habitable zone. The calculations show that billions of the stars in the Milky Way will have one to three planets in the habitable zone, where there is the potential for liquid water and where life could exist. The results are published in the scientific journal, Monthly Notices of the Royal Astronomical Society. Using NASA's Kepler satellite, astronomers have found about 1,000 planets around stars in the Milky Way and they have also found about 3,000 other potential planets. Many of the stars have planetary systems with 2-6 planets, but the stars could very well have more planets than those observable with the Kepler satellite, which is best suited for finding large planets that orbit relatively close to their stars. Planets that orbit close to their stars would be too scorching hot to have life, so to find out if such planetary systems might also have planets in the habitable zone with the potential for liquid water and life, a group of researchers from the Australian National University and the Niels Bohr Institute at the University of Copenhagen made calculations based on a new version of a 250-year-old method called the Titius-Bode law. The Titius-Bode law was formulated around 1770 and correctly calculated the position of Uranus before it was even discovered. The law states that there is a certain ratio between the orbital periods of planets in a solar system. So the ratio between the orbital period of the first and second planet is the same as the ratio between the second and the third planet and so on. Therefore, if you knew how long it takes for some of the planets to orbit around the Sun/star, you can calculate how long it takes for the other planets to orbit and can thus calculate their position in the planetary system. You can also calculate if a planet is 'missing' in the sequence. "We decided to use this method to calculate the potential planetary positions in 151 planetary systems, where the Kepler satellite had found between 3 and 6 planets. In 124 of the planetary systems, the Titius-Bode law fit with the position of the planets. Using T-B's law we tried to predict where there could be more planets further out in the planetary systems. 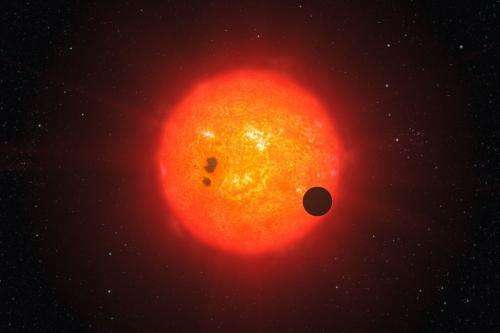 But we only made calculations for planets where there is a good chance that you can see them with the Kepler satellite," explains Steffen Kjær Jacobsen, PhD student in the research group Astrophysics and Planetary Science at the Niels Bohr Institute at the University of Copenhagen. In 27 of the 151 planetary systems, the planets that had been observed did not fit the T-B law at first glance. They then tried to place planets into the 'pattern' for where planets should be located. Then they added the planets that seemed to be missing between the already known planets and also added one extra planet in the system beyond the outermost known planet. In this way, they predicted a total of 228 planets in the 151 planetary systems. 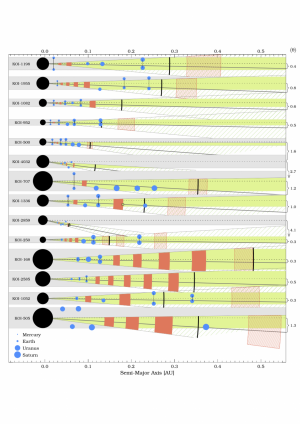 "We then made a priority list with 77 planets in 40 planetary systems to focus on because they have a high probability of making a transit, so you can see them with Kepler. We have encouraged other researchers to look for these. If they are found, it is an indication that the theory stands up," explains Steffen Kjær Jacobsen. Planets that orbit very close around a star are too scorching hot to have liquid water and life and planets that are far from the star would be too deep-frozen, but the intermediate habitable zone, where there is the potential for liquid water and life, is not a fixed distance. The habitable zone for a planetary system will be different from star to star, depending on how big and bright the star is. 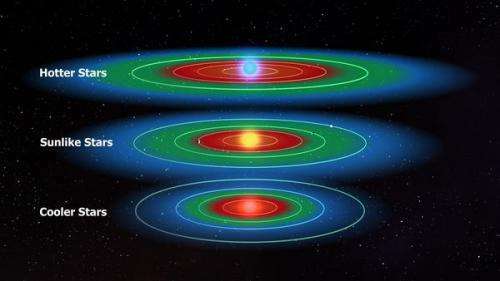 The researchers evaluated the number of planets in the habitable zone based on the extra planets that were added to the 151 planetary systems according to the Titius-Bode law. The result was 1-3 planets in the habitable zone for each planetary system. Out of the 151 planetary systems, they now made an additional check on 31 planetary systems where they had already found planets in the habitable zone or where only a single extra planet was needed to meet the requirements. "In these 31 planetary systems that were close to the habitable zone, our calculations showed that there was an average of two planets in the habitable zone. According to the statistics and the indications we have, a good share of the planets in the habitable zone will be solid planets where there might be liquid water and where life could exist," explains Steffen Kjær Jacobsen. If you then take the calculations further out into space, it would mean that just in our galaxy, the Milky Way, there could be billions of stars with planets in the habitable zone, where there could be liquid water and where life could exist. He explains that what they now want to do is encourage other researchers to look at the Kepler data again for the 40 planetary systems that they have predicted should be well placed to be observed with the Kepler satellite. This story in combination with the other story today about scientists created nucleic acids from simple chemicals certainly indicates the universe must be thriving with life.